Gillman’s gender idea of inequality is still somewhat present in today’s society. Society treats women as if their role is to be a mother, a wife, and to be taking care of the house and everything involved in it, while the men go out to work and bring food to the table. In the work place women get paid less than men for the same job, but why is that? You would think that a person’s education, experience and knowledge of the subject will have a greater impact in the job instead of gender. As we discussed in class women today have taken the role of a man in order to make it in the work place. Some have decided that in order to make it far in in their career, they have to decline being a mother and a wife, which is not true, but that is how society sees it. My mother has a degree in computer engineer, and when she went to get her first job in the field after graduation in our Country Dominican Republic, they denied her and their explanation was that even if she was qualified they weren’t going to hire her because as a women she was going to require a lot of permission due to her cycle, and her child getting sick. When she told me that all i thought was that they couldn’t have been more ignorant to give such an idiotic excuse. Even though things have changed a little in today’s society since more women are doing a man’s job and more men are staying home, there is still that gender inequality when it comes to getting out there and finding jobs. I found this quote to be interesting and true. “We’ve begun to raise our daughters more like sons..but few have the courage to raise ours sons more like our daughters” Gloria Steinem. This entry was posted in Uncategorized and tagged gender, gender inequality, Gillman, men, society, women, workplace. Bookmark the permalink. I liked and agree with “That’s Racist”. This one, though… I’m curious… If companies can get by with paying women less money for the same quality of work as men, then why don’t we see any companies with all female labor forces using those lower costs to dominate the marketplace? Oh, good comment…Wouldn’t that save the company a few extra bucks if they only had a female force. But that is also if there still is a true money gap between genders, which in some divisions still exists. You also wouldn’t have any mans check to compare it to so i guess hire one man just to show the woman that they are getting paid less. Would that work…? lol. Okay, i understand your true point where gender needs to be more equal and started from the beginning. I believe its happening to a certain extent. I learned to cook when i was young and also learned to clean up after myself. my parents taught me well. 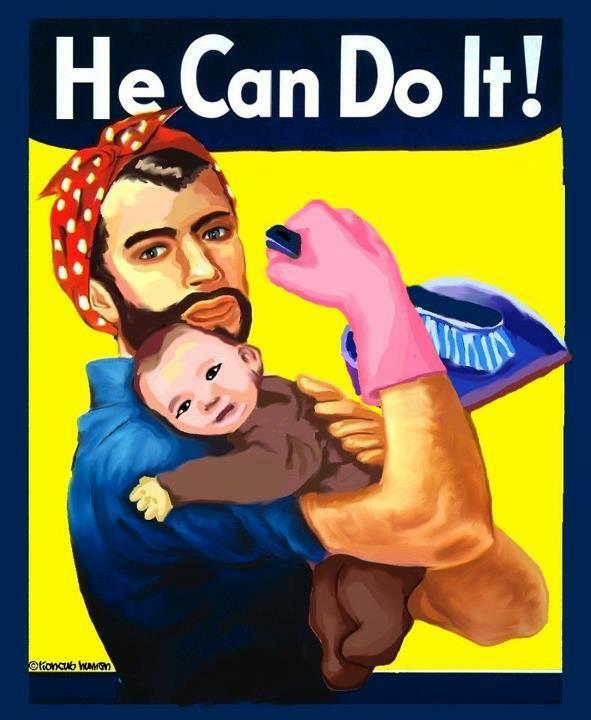 I also believe that it doesn’t matter what gender you are, if a job has to be done in the home or via working outside the house, then get it done no matter what “gender role” there is. If there is a mess then men get on your knees and clean it up. If we need money then woman go out and bring some money in the home. both can do it, but in truth both jobs must get done and it truly doesn’t matter who does it. Just that its completed. G..that is a good question, but maybe they don’t do it that way because it would be considered as discrimination towards men? who knows. Adam…I agree with what you said that “if a job has to be done, then get it done no matter what gender role” no matter the place. I am glad that your mom took the time to teach you how to cook and clean up after yourself when you were younger. I am sure it has become handy now that you are an adult, because you won’t have to be buying take out food all the time, and you can eat healthy and save money (if you live alone). I dont agree with the reason why the girls mom didnt get the job in D.R., but overall I just don’t agree with women acting hopeless. Every employer isn’t the same, every guy isnt the same, you’re not going to get every job because you’re qualified. Black people have been dealing with issues like this forever, and current. I don’t understand why women are acting like they are the only ones going through issues such as this one, then bring up outdated examples to support this weak argument. There are very successful and powerful women. All these excuses don’t amount to anything, but teaching your daughters that you have less of a chance of a man since birth. Some girls fall victim to this excuse, and dwell on it, and it’s sad, and it’s only going to get worst if women don’t stop it already. What about scenarios when women only hiring women because they feel part of this cult of women power, what about scenarios where men only hire women because to plan on getting laid by their employee. My point is that where there are disadvantages, there are advantages. When you’re complaining about one side of a scenario, there’s a flip-side where someone else is getting the shorter end of the stick. The world isn’t perfect and it never will be. Furthermore, when women make reference to over 5 decades ago to support inequality claims, the fact remains women were supported, there was more structure, and women in general were more respectable. Now days, women have less to offer, and want more, for the end the result of a women to say, “I want a man who can support me”, but when women were being support, they wanted to work. In conclusion, women don’t know what they want, they are always out thinking themselves, its like watching a dog chase it’s own tail. Unfortunately, some men join the tail chase. I understand women complaints, but you guys aren’t looking at the big picture.